Today I am dedicating a cookie recipe to a special sweet baby that God sent for 12 days before needing him back home. His name is Noah Haskovec and God gave him to parents (Angie and Jarrett) that bravely chose to take their heartbreak and create a tool to encourage others to live out kindness in remembrance of their son. I am blessed to work with Noah’s mommy and for the second year one of my kindness projects is to feed her at work for the month of October. What is so great about Noah’s Kindness Project is its simplicity. You can either plug into a few of the service projects that are listed on the site or you can think of your own. It can be done on your time schedule (and doesn’t necessarily have to be done in October because goodness knows we can use kindness throughout the year.) Here is the link to learn more about the program. Please consider spreading your own unique brand of kindness. You have been given gifts and talents that can help others. I like this cookie because it isn’t too sweet and works well with a spelt or gluten free flour so my husband who is wheat sensitive can eat them. The cookie is very tender and decorated with blue and white sprinkles to resemble the sky and clouds with a little rainbow colored edible glitter. Preheat oven to 375 degrees. Prepare cookie sheets by lining with parchment paper. In large mixing bowl, combine sugar, butter, egg and almond extract. Beat until light and fluffy. Shape into 1 Tbsp balls and then roll into 2 inch log. Place on prepared cookie sheet. Repeat with the rest of the dough placing 2 inches apart. Bake for 9-12 minutes or until set. Cool completely. In microwave safe dish place chocolate chips and coconut oil. Heat in 30 second increments at 50% power, stirring until smooth. Dip one end of each log into melted chips, then sprinkle dipped ends with sprinkles or almonds. Place in refrigerator to help set the chocolate before storing. I found this recipe as I was going through Pinterest late one night and am so glad I did because they take an old-time favorite and turn it into something even better. 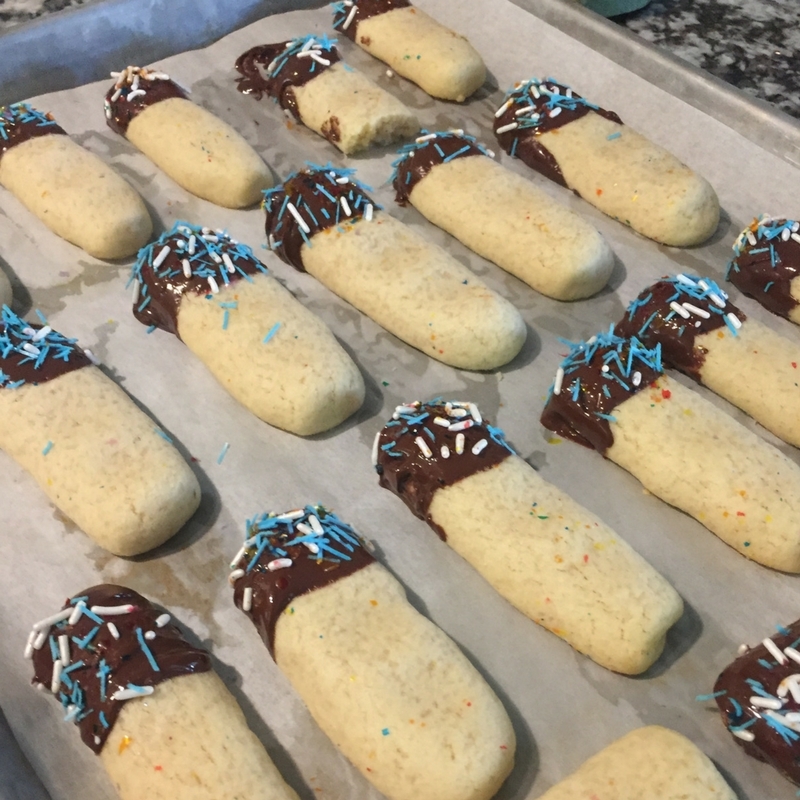 If you have been following my blog for long – you know I like sprinkles and so I doctored these up with a little royal frosting and sprinkles. Melt marshmallows and butter over medium heat in large pan, stirring constantly. Remove from heat. Add vanilla, rice krispies and sprinkles and mix well. When mixture is cool enough to handle, butter your hands and form into ping pong size balls. Place on parchment paper. If mixture becomes hard to manage, rewarm slightly on stove. Mix up frosting ingredients and drizzle over top. Add more sprinkles. I saw this idea and had to try it. Here was my list of Whys? The finished product shouted FUN! And the number 1 reason – There were sprinkles involved. So I went to my sprinkle drawer – don’t judge! You might be surprised to know how many times sprinkles has allowed me to look more together than I felt on a given day. The recipe below is basic and add-ins could definitely be incorporated: mini marshmallows, chocolate chips, dried fruit cut up, shredded coconut, cinnamon, etc. But I wanted to keep mine in a less sweet mode so I stuck to 5 ingredients. 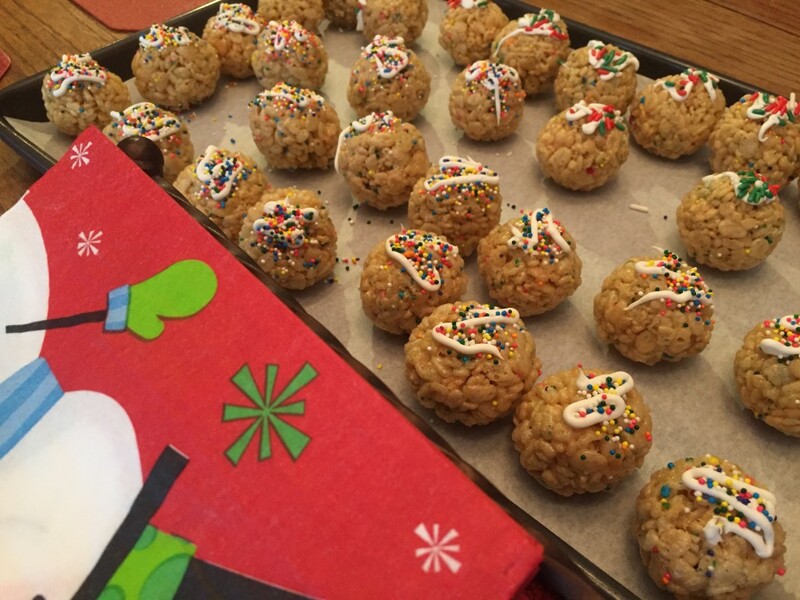 A very easy treat with a touch of sweetness that can incorporate healthier ingredients. 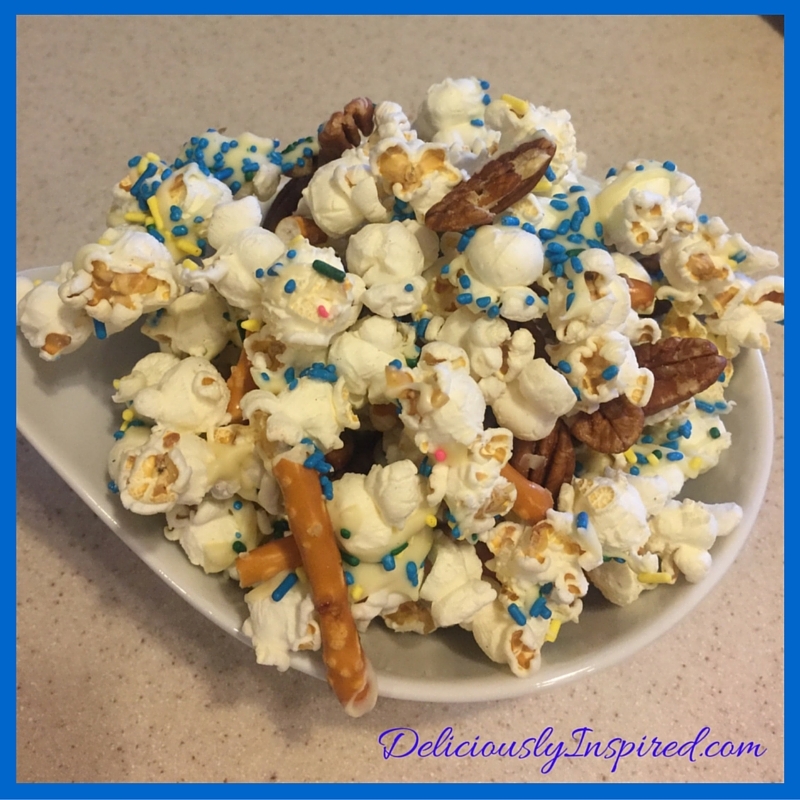 Place popcorn, pretzels, nuts on top of parchment paper. Place white chocolate chips in microwavable bowl and heat in 20-30 second intervals, stirring each time until smooth. Then immediately (while chocolate is still warm) shake sprinkles on top, especially where the chocolate landed on the mixture. Place in freezer or refrigerator for 15 minutes. Place mixture in bowl or individual bags for gifts and Enjoy! This recipe would make a great contribution to a pot luck, hostess gift, neighbor gift, thinking of you gift, stocking stuffer. Plus the ideas for coordinating with holidays and parties are endless. I am adding this recipe to one my preschool grandchildren can help with in the kitchen. You may be asking why I choice the colors of sprinkle I did. Well – I had one container that had a little of each color and this allowed me to empty the container – my contribution to downsizing a bit. What would your selection of ingredients be if you made this?